Review these tips to avoid altitude sickness. Please carpool. Parking is very limited at Eagle Rock. When you arrive at Eagle Rock, you will be asked to drop off passengers for check-in and then move your car to the lower parking lot. Eagle Rock is a pedestrian campus. 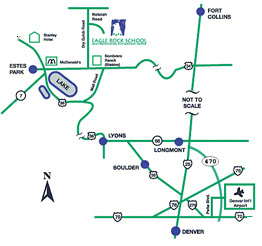 Estes Park Shuttle is available for transport from Denver International Airport directly to Eagle Rock’s campus. You may reach them at (970) 586-5151 or http://www.estesparkshuttle.com for details and rates. For weather and road report information, please call (303) 639-1111 or visit cotrip.org. (1 hour, 15 minutes): Take Hwy. 36 north out of Boulder to the town of Lyons. At the first stoplight, turn left and go through the town of Lyons. Exit right at the Hwy. 36 Estes Park sign. Follow Hwy. 36 all the way into Estes Park. When you see Lake Estes prepare to turn right onto Mall road. At the first stop sign turn left onto Hwy. 34. Take the first right onto Dry Gulch Road (Sombrero Ranch is on the corner). You will travel 2 1/2 miles on Dry Gulch and take the first right that is Notaiah Road (You will see the Eagle Rock School sign at the road). Stay right at the fork to the upper parking lot to check in then you may move your car to the lower parking lot. (2 hours): Take I-25 north to the Hwy. 66 exit 243. Turn left off the exit ramp onto Hwy. 66 and follow it all the way through the town of Lyons. Exit right at the Hwy. 36 Estes Park sign. Follow Hwy. 36 all the way into Estes Park. When you see Lake Estes prepare to turn right onto Mall road. At the first stop sign turn left onto Hwy. 34. Take the first right onto Dry Gulch Road (Sombrero Ranch is on the corner). You will travel 2 1/2 miles on Dry Gulch and take the first right that is Notaiah Road (You will see the Eagle Rock School sign at the road). Stay right at the fork to the upper parking lot to check in then you may move your car to the lower parking lot. (2 hours): From the Main Terminal (4.1 miles) or Car Rental Agencies, go west on Pena Blvd. to exit 6B. Go north (17 miles) on E-470 toll road to Exit 47 (I-25 North exit toward Fort Collins). Take I-25 north to the Hwy. 66 exit 243. Turn left off the exit ramp onto Hwy. 66 and follow it all the way through the town of Lyons. Exit right at the Hwy. 36 Estes Park sign. Follow Hwy. 36 all the way into Estes Park. When you see Lake Estes prepare to turn right onto Mall road. At the first stop sign turn left onto Hwy. 34. Take the first right onto Dry Gulch Road (Sombrero Ranch is on the corner). You will travel 2 1/2 miles on Dry Gulch and take the first right that is Notaiah Road (You will see the Eagle Rock School sign at the road). Stay right at the fork to the upper parking lot to check in then you may move your car to the lower parking lot. (1 hour 15 minutes) Head West on Highway 34 to Estes Park. Once out of the canyon take the first right onto Dry Gulch Road (Sombrero Ranch is on the corner). You will travel 2 1/2 miles on Dry Gulch and take the first right that is Notaiah Road (You will see the Eagle Rock School sign at the road). Stay right at the fork to the upper parking lot to check in then you may move your car to the lower parking lot. (1 hour) Head West on Highway 34 to Estes Park. Once out of the canyon take the first right onto Dry Gulch Road (Sombrero Ranch is on the corner). You will travel 2 1/2 miles on Dry Gulch and take the first right that is Notaiah Road (You will see the Eagle Rock School sign at the road). Stay right at the fork to the upper parking lot to check in then you may move your car to the lower parking lot.